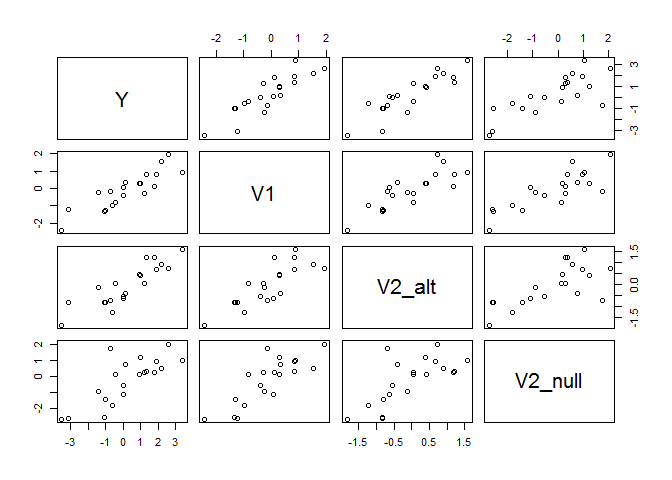 Business problem: A manager suspects that a given variable V2 is significantly predictive of a Y, but V2 is extremely correlated with V1, a variable already incorporated into your company’s simple linear model. The manager wants the answer now: is V2 important or not? Is it informative/safe to look at linear model coeffecients in a regression of V1 and V2 on Y? What other strategies are worth considering? Does running a linear model on the residuals of a first stage model help? How can we measure results in terms of false postives vs. false negatives? We simulate data using the mathematical setup described above. So, from the plot, we see that positive relationships between outcome Y, the standard business metric V1, as well as between Y and the new business metric V2, in both cases. The main takeaway from this graph should be that Y vs V2alt* and *Y* vs *V*2*n**ull* look similar, even though *V*2*n**ull* has no relationship on *Y* when controlling for *V*1, while *V*2*a**lt does. Note that Sum of Squares are the same as the first comparison in anova(fullModel), but degrees of freedom are different. That’s why anova(model1,model2) is best. Someone I talked to suggested first regressing Y on V1, and then the residuals on V2. I wouldn’t recommend this approach! We could compare procedures by using what metrics? The following code builds a framework to simulate datasets and test different decision criteria with custom loss functions. linear_model$coef %>% #[c("V2_alt","V2_null")] %>% // only return one?? #true_effect: numeric vector of true effects to measure. true_effect <- c(true_effect) #test type II error as well! 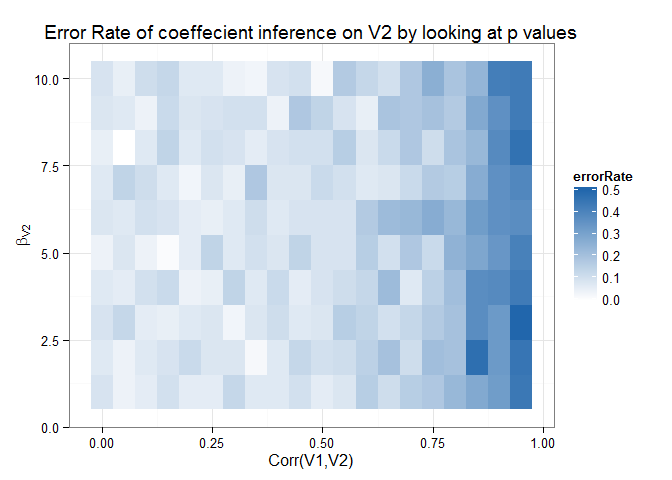 Finally, we put everything together into a heatmap that visualizes our error metric in terms of the correlation between V1 and V2, and the true value of V2. In this example, the error rate is the false positive rate + false negative rate. Higher values are bad. Lesson: be careful with correlated regressors!